Welcome to my page completely dedicated to the dolls and toys for the huuuuge box office hit, Disney's Frozen! Yes, all the characters you love and adore can be yours to own, in the form of dolls or toys! If you've not heard of this animated feature, then you must have been sleeping under an iceberg! Based on Hans Christian Andersen's classic tale "The Snow Queen", this adaptation tells a beautiful tale of friendship and sisterhood, and featuring the vocal talents of Broadway star, Idina Menzel and Kristin Bell. It's hardly surprising that this animated classic has been loved and adored by the entire world. If you're looking for Princess Anna and Princess Elsa dolls, then you are in the right place. If you are looking for Olaf the Snowman, then you'll need Amazon.com's dedicated page to the chilly fella himself, including loads of dolls. They also have a page for the super cute Sven the Reindeer! If however, you're looking for Kristoff dolls, visit Amazon.com's page here, and finally, if it's Hans dolls you want, then go here. 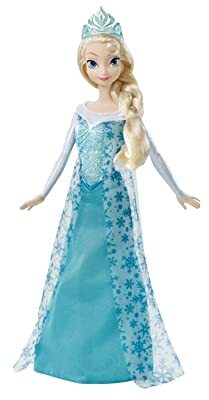 If you're feeling impatient for Princess Elsa and Anna dolls, you can always go straight to Amazon.com's exquisite collection of Frozen Dolls then click here right now! Be sure to bookmark this page, as I will keep it updated as more and more Anna and Elsa dolls get released...and let's face it...with the enormous success of Frozen, the Disney folks are going to keep new dolls coming! Enjoy, and hope you find what you're looking for! Who's your favourite Frozen Princess? Are an Elsa fan, or an Anna fan? Starting the collection off is this gorgeous Anna doll, complete with her two braids and pink tiara. Her outfit is identical tot he one featured in the film - I mean, come on, how gorgeous is the intricate design on her bodice and skirt - gives a real sense of the classic Norwegian history and ancestry, right? Kids will love playing with this doll, and adults alike will love having this in their collection. It's really not too expensive either, so it's perfect for a first time collector, or for doll that is going to get a lot of use out of, especially as all children love to recreate their favourite moments from the movie. The detail here is huge. A fantastic doll for any fan of the daydreaming Anna. 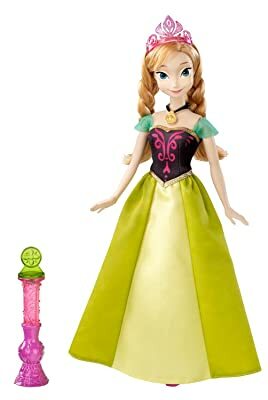 The beauty of this fabulous Anna doll, is that it's musical! But that's not all, it also lights up! Whilst this doll, looks very similar to the Anna doll above, you can see there is a difference in the skirt and bodice design. Yet, it stills features the same beautiful detail in the face and hair. Utterly gorgeous! Considering Frozen is a musical, it's a nice little addition to the doll itself to have it play music. 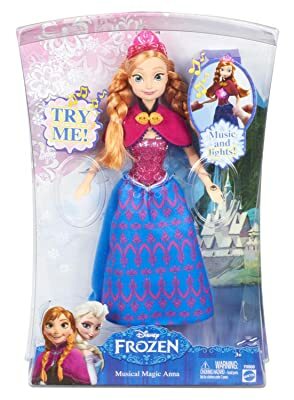 To make the magic work, all you have to do is hold Anna's hand, and she will light up and play music...and what's more, if this doll touches hands with the Princess Elsa Musical Doll (links below) they will sing together in harmony - how freeeeeekingly cute is that? I love it!!! ...it comes with a magic wand, with a secret ingredient hidden in the tip: water. Simple brush the top of the wand over Anna's dress and the colour will miraculously change. Amazing, right? Children will marvel at the unbelievable coolness of this doll, and adults alike will love seeing other people's faces as the trick is revealed. The people that design these toys are a clever bunch, aren't they? Just incase you haven't seen Frozen yet, here's a trailer for you. Or even if you are the biggest Frozen fan, why not watch it again, just for old time's sake! Personally, I can't watch it enough, and tragically, I probably know it all word for word....eeeek! 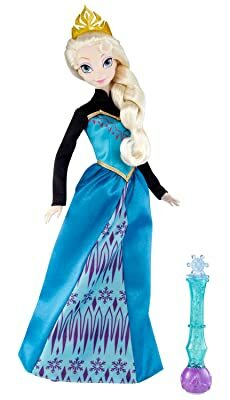 I love this Princess Elsa doll. Best known for her powers of turning things to ice, her dress gives the feel of that perfectly. Isn't the doll just so beautifully designed! Everything from her icy, glittering tiara, to her sparkling, diamond like cape, says quality to me. Perfect for any collector of special dolls, or for anyone who loves Disney. Just when you thought a Disney doll couldn't get cuter, you suddenly come across a musical Princess Else doll! Who wouldn't love this? Not only is it musical, but it also lights up! And what's more, team her up with her sister (Princess Anna, as featured in the dolls above) and the pair will duet together, like having a real life Frozen scene in front of your eyes. The perfect gift for any fan of the Frozen. The beauty of magic will never be so captivating than with this precious Princess Elsa doll. Simply, add water to the magical wand, and when contact is made with the dress, a beautiful Norwegian inspired design will appear. Gorgeous! 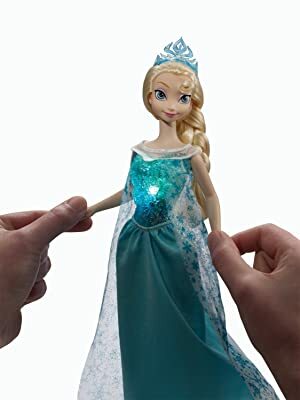 This fabulous colour change doll has had nothing but excellent reviews from the Amazon websites, so click on the links and see for yourself why so many people love this perfect piece of Frozen memorabilia. Bookmark this page, more frozen dolls & Toys coming soon!